In the near future, technology will allow for large-scale and sophisticated interventions into many more areas of urban life: from analysing traffic patterns and effective zoning of the urban areas to building communities. At the same time, ubiquitous connectivity is forging ahead the so-called ‘digital’ thinking: real-time data analysis creates on-demand (at its best – instant) adaptive urban systems. Well-known examples of this are Uber providing traffic mobility, or Pavegen, a promising start-up that develops a new type of streetlight powered by solar energy and generating light by the footsteps of people walking by. ‘Smart city’ is the ultimate dream of this digital age: the technology-driven megapolis where urban problems are fixed through real-time feedback and algorithm-based solutions. In this city, engineer becomes the new urban profession, alongside with architects and urban planners. The complexity of the ’smart’ urban systems calls for interdisciplinary research and collaborative integrated design based on the understanding of the physical space and materials as well as the potential of the emerging technologies. The theme of this year – what Strelka has called ‘Hybrid Urbanism’ – sets out to explore the ways digital technologies are manifested in the space of the city and speculate on their potential applications and transgressions. Throughout the program the students worked with experts and program curators – Liva Dudareva and Eduardo Cassina (METASITU), Frolic Studio, Extrapolation Factory, Paul McCabe, Pierluigi Dalla Rossa and others – to develop the theme. 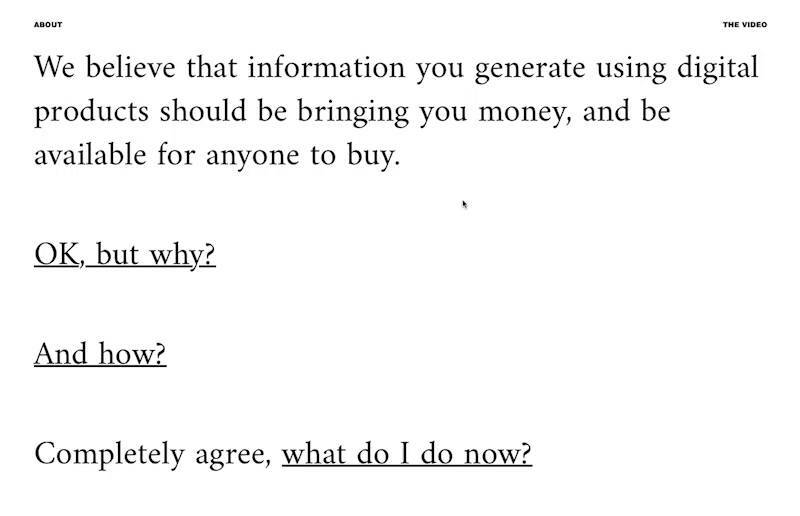 If personal data becomes the new economic resource, how can we claim ownership of it? When Google inevitably moves into the urban space, what new regulations will accompany this expansion? How can something small, such as ad blockers, contribute to a positive change in food industry? When the city is no longer brick and mortar but a responsive sensor-powered environment, what new behaviours will it bring? These and other questions were the core of the 7 final design projects by the students. All the projects presented below were conceived by the students, researched, and carried out within the last 6 weeks of the program. The studies concluded the year and gave Strelka students an opportunity to employ the knowledge and skills acquired throughout different modules of the curriculum. The students worked independently in teams, looking into future urban scenarios through the lens of emerging technologies and digital thinking. Throughout the project Strelka students were encouraged to critically highlight controversies of the new age, reach out to experts and give peer-to-peer feedback as part of weekly progress reviews. New to this year: all groups created working prototypes to illustrate the mechanics of their studies. 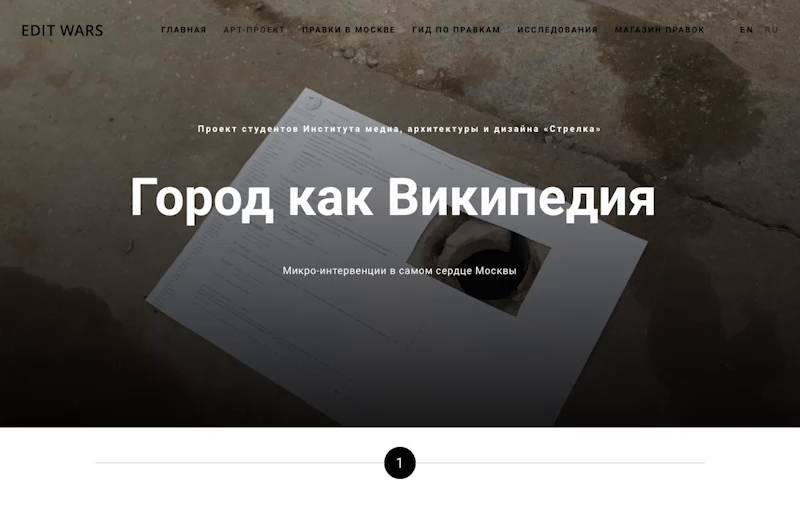 These projects are the result of the sixth educational year at Strelka Institute for Media, Architecture and Design. Strelka education program is a postgraduate experimental course that is set to explore the challenges facing cities today and educate the next generation of urbanists. The program is centred around research and design for the city and encompasses tools and approaches from a wide variety of disciplines. Program curators and supervisors are Andrey Manirko and Evgeniya Pospelova. Project Data Coup critically examines the default way we now treat information generated online, and aims to challenge this status quo. It projects the logic of wealth accumulation, shared by most tech giants today — collection, analysis and monetization of users’ generated data — into the future and illustrates how such approach can lead to serious societal-level implications. Starting from a core belief that in the future the information will need to be treated as an open commodity, the project proposes a possible solution: a design of an ecosystem that allows anyone who wishes to access people’s generated data, to do so directly without having to go through a third party, like Google or Facebook. For people on the other hand, it allows to benefit and earn from the data they produce, while exercising control – what information they are willing to share, whom they share it with, and how much they get paid for it. A manifesto for the information society outlines the challenges lying ahead and presents a diagram of a possible solution. The ad-based business model of most tech companies rests on the convenient assumption that value generated by users happens inside a digital “vacuum”. But users are real people, and before being present in the digital space of tech platforms, they are always actually present somewhere in the physical space of the real world. 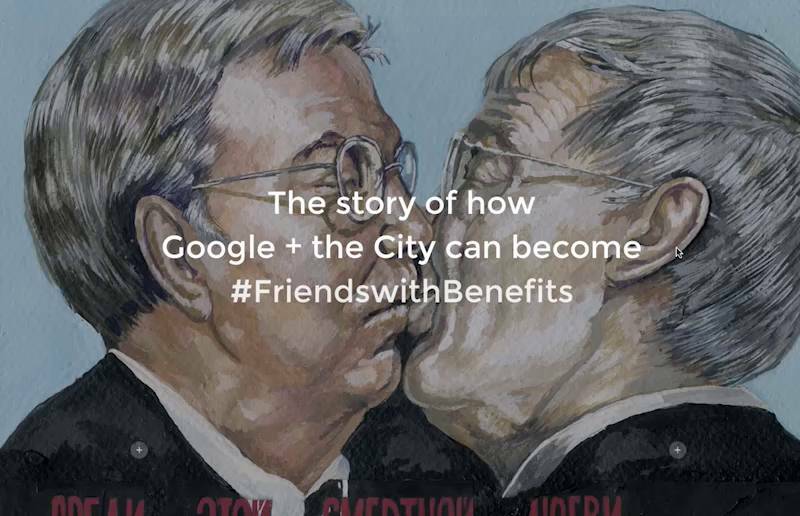 If Google benefits from digital access to people in shared space, it should give something back to the city. As this project speculates, there’s a smart way to do it. An open letter to Eric Schmidt, the executive chairman of Google's new parent company, Alphabet. Set your attention level and learn about ‘Google Urbanism’. Today's cities depend on their human capital: if the citizens are better off, the city itself develops at a faster pace. So the city administrations design their policies and spend billions to attract diverse and quality specialists, from optimising taxes to providing quality communal services to investing into culture and launching innovation parks. These policies are often successful which, paradoxically, makes these cities far less attractive for gifted young specialists without solid savings. As a possible solution, the project proposes City Scholarship: a financial plan for cities blends together the idea of basic income and elements of startup accelerator programs. 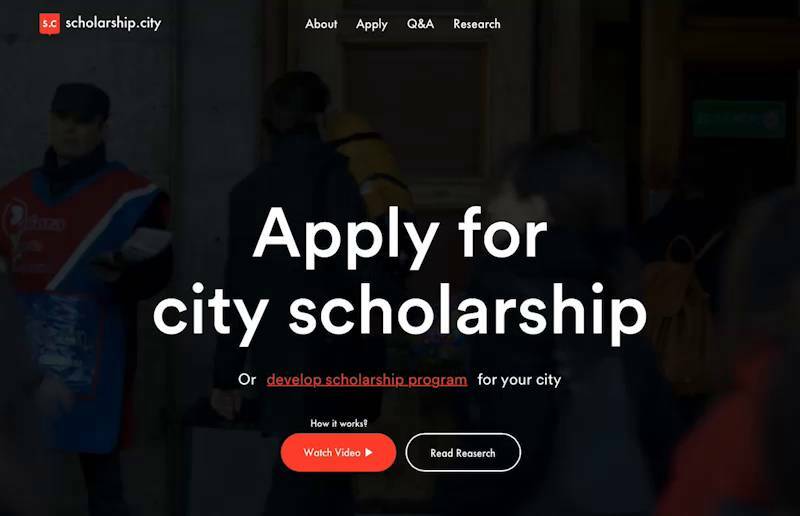 Fill in the form and apply for the Scholarship or find out how to develop a solution for your city. A speculative proposal for a City Scholarship program: a financial plan to attract and keep talented people in the city. Fill in an application form and read research supporting the existence of this program. The essence of the today's pervasive connectivity is such that little strategically implemented interventions can have a largely multiplied structural effect. The precise extent of this effect is still a question. Can something as simple and ubiquitous as an ad blocker be manipulated in a way to form habits and influence the development of industries? If applied to such vital urban spheres as food industry and health care, can it be capable of making a shift in citizens' eating habits and boost healthier food production? Based on a research into key trends in food industry and online advertising, the project proposes a future scenario to test this theory. A research into the future of food and a speculative proposal for engineering better eating habits and supporting healthier food industries with the help of ad blockers. The project analyses the technological shifts in architectural design and construction and speculates on the future of architecture as an industry. As this future scenario claims, the technological advancements will eventually allow for data-driven architecture: designs will be created by algorithms from database elements and styles, while construction will be programmed and overseen by machines. In this situation, what would the cities and suburbs look like? Would the designs look rational, efficient and bleak or will it create a realm of Mass Market Architecture, where buildings are cheap, easily customised and create a blast of random, unregulated compilation of corporate or signature starchitect styles? As a prototype, the project offers a game: a possible interactive tool for generating architectural designs. 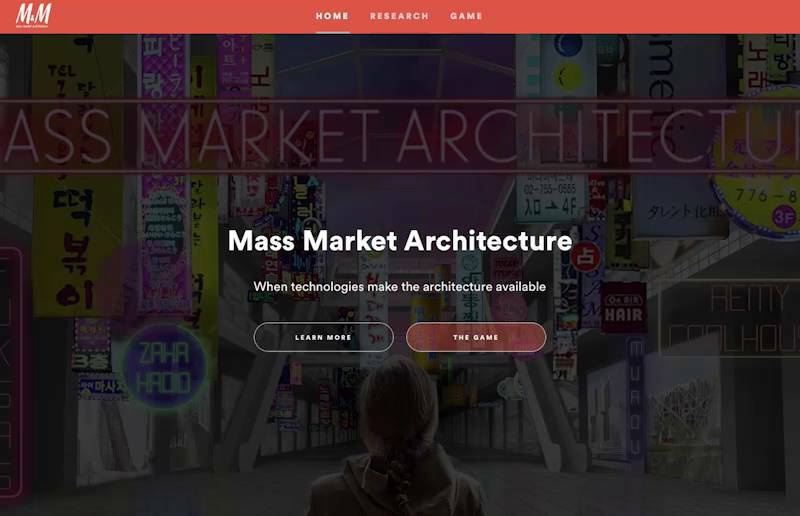 Landing page of a fictional service which claims that anyone can create architectural designs and build a house. The project delves into research and comparison of the similarities between the behaviour of online users and citizens in the physical space of the city. As they are in fact mostly the very same people, can some of the patterns of online behaviours be paralleled in the urban space? To what extend will the physicality of the city allow for it? Could the citizens edit the city or even cancel edits if they are not satisfied with changes? How could these patterns of online behaviours be used for the city's benefit? Photos, walking routes and texts about the way people edit the city. Explore whether the city is similar to Wikipedia or not, find out what an ‘edit war’ is, and how you could edit the city. The current technical status quo sets the informational device, such as a smartfon or computer, as the key channel of communication. This project argues that there will soon emerge a new kind of interaction based on two trends: the interaction surfaces we use today will expand to include the micro scale of embedded technology - sensors and microcontrollers. At the same time, the vast concentration of sensors will form the marco scale of ubiquitous sensor spaces – whole cities and territories. 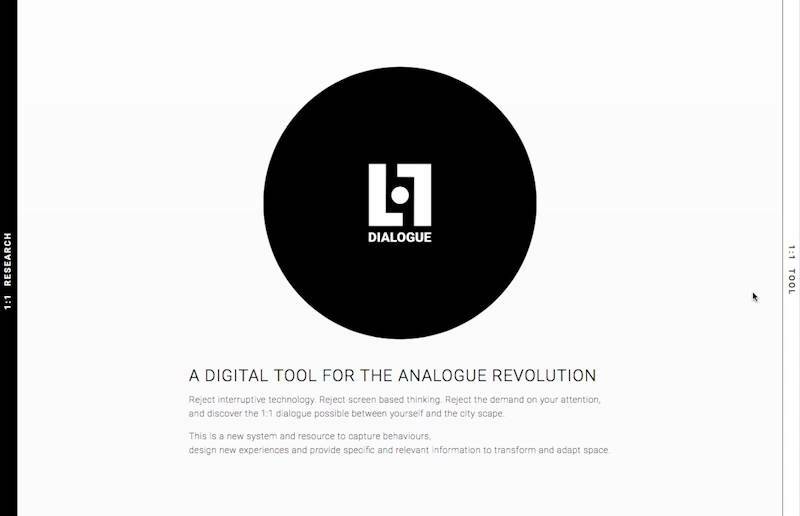 1:1 Dialogue is a tool to reveal and contemplate possible urban interactions between the citizen and the city. The project proposes a new system and methodology to capture behaviours, design new experiences and provide specific information to space about how to transform and change. A showcase for the research and development of a methodology to create new urban interactions that are more intuitive for citizens and liberate attention.